No words can express how grateful I am to my identical twin sister for sticking by my side for one of my most difficult marathons ever. 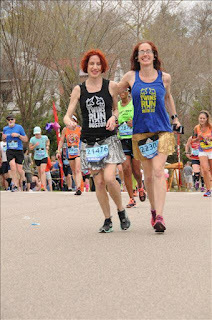 Despite one bad thing after another sabotaging the race I had trained months for, I was determined to spend most of the Boston Marathon not wallowing in how badly I was feeling (both physically and emotionally), but being appreciative for the support of my sister because without her the entire experience would have been so much worse and not nearly as special and memorable. 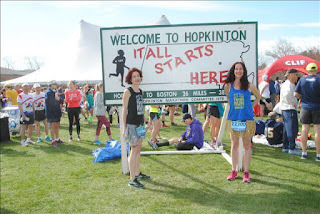 My biggest post-race regret is wondering if I’d adjusted my goal before the starting line, could we both have actually enjoyed the time from Hopkington to Ashland, Framingham, Natick, Wellesley, Newton, Brookline, and Boston? 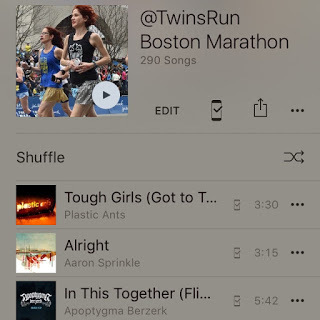 Was it ever possible for me to have a relaxed, celebratory, long run to Boylston Street? Or was I doomed to experience extreme discomfort and struggle to finish no matter what? 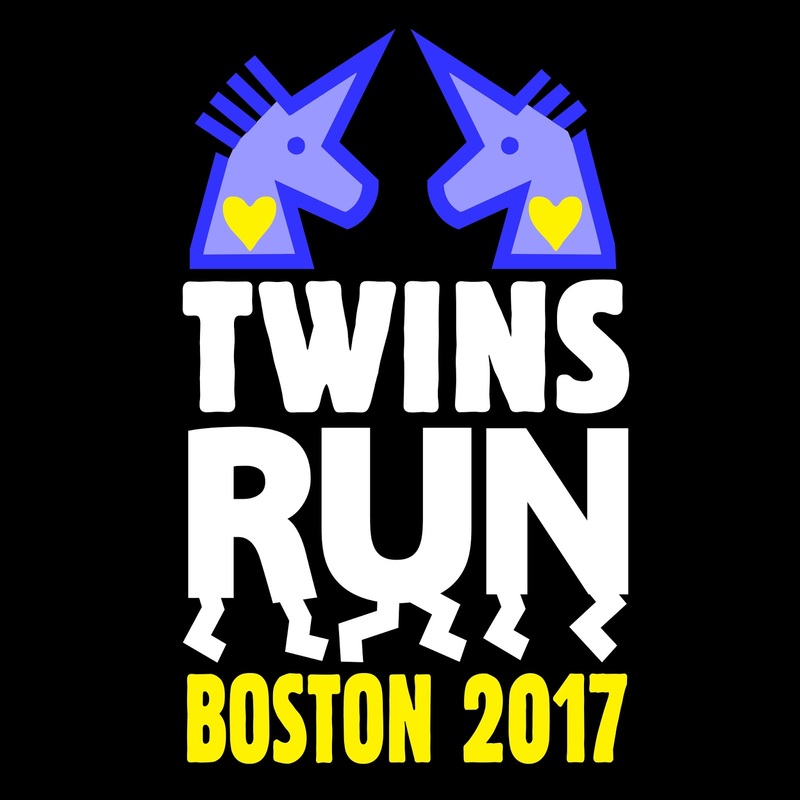 Even though I was struggling for miles and miles, it gave me a boost to see how excited my twin was to be there ... hi-five'ing hundreds of fans, smiling as they called out "GO TWINS RUN!" "LOVE THE SPARKLE SKIRTS!" 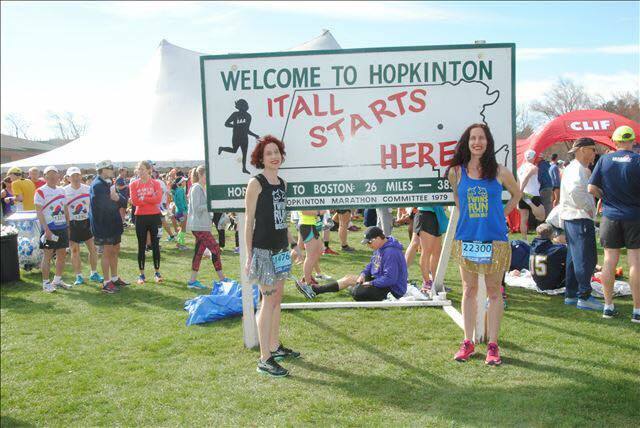 I competed in three races before Boston that predicted I was in shape for a 3:42-3:51 marathon (two ten milers in 1:21 and 1:20 and an 8K in 38:53). So I felt relatively confident that under the right conditions I could run my A goal of 3:52, especially since I had previously run Boston in 3:53 in 2013 and 3:52 in 2014. 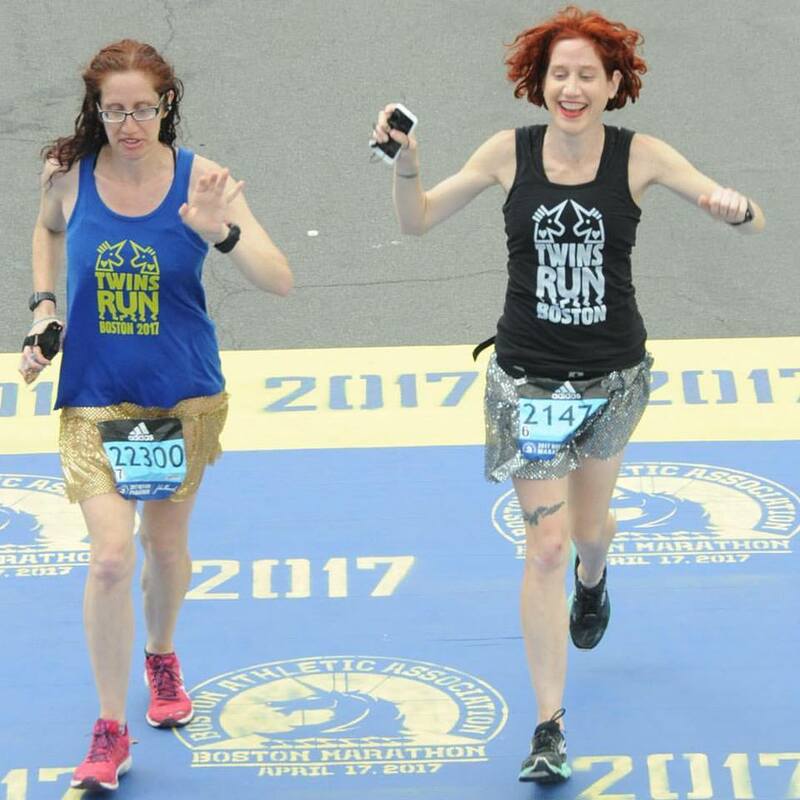 Not only did I have those race performances to boost my confidence, but for the first time in leading up to the Boston Marathon, I had run five long runs of 20 miles or more on the roads, the longest being 24 miles. My final long run was my strongest and fastest and I truly believed I was ready to move past my disappointing performances in Boston 2015 and Chicago 2016 when I ran 4:08 and 4:07. It seemed like an eternity since the last time I achieved my goal in a marathon - Chicago 2015 when I ran 3:49:56 to BQ for 2017, but I was hopeful I could finally break my bad streak of "failures". The first thing that derailed me on race day was a blister on the top of my right big toe. I can’t believe how something so small can hurt so much, and I’ve never had a blister develop so soon into a race. I was trying to adjust my gait to not exasperate the pain, but it was of no use. After 5K I knew a time goal was out the window, but our pace didn’t really start to tank until after 13 miles, that’s when I realized it was going to be a long, painful day. I was near tears confiding to my sister, “I can’t believe I trained so hard for this and it was all for NOTHING!.” Unfortunately, it wasn't just the blister that I had to endure. As the miles went on my piriformis was seriously hurting me (and I had endured three dry needling sessions a week prior to the race hoping to calm down the area), I got some serious chafing under my right arm and I felt really hungry early on despite eating more prior to the race than I ever had before and taking gatorade at nearly every stop. I had no energy and felt tired by mile 14 and it just kept getting worse every mile thereafter. I was running 11-12 minute pace and wasn't even stopping for a walk break. This was the first time I actually "ran" through the Newton Hills without stopping for a lengthy walk break. 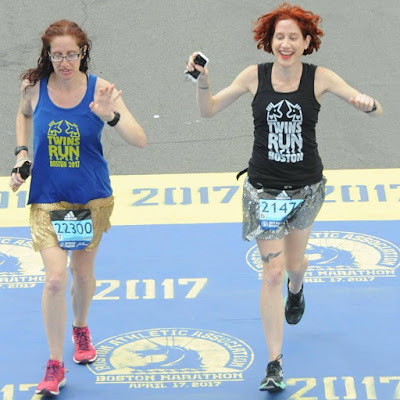 I shared my race photos with a co-worker who asked if I always run with my hair down. Not usually! That’s a clear sign of me giving up on time and hoping for some decent race photos. That’s also why I always run a marathon with lipstick in my pocket. I started reapplying as I was slogging up Heartbreak Hill and a spectator laughed, “Look at her! She’s running and putting on lipstick!” I did so one more time at mile 25 in the portapotty with the added benefit of having a mirror. 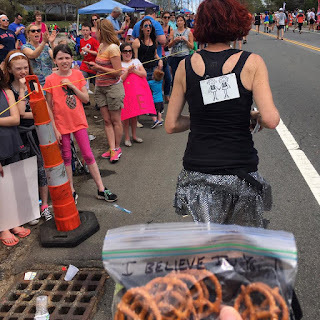 Soon after that I grabbed a bag of pretzels and nearly broke down in tears when I saw a message was written on the plastic bag, “I BELIEVE IN YOU!” That was the only photo I took along the course – a picture of that bag in front of my sister running ahead of me. My husband thinks that kind of motivational stuff is corny, but I NEEDED that so much at that point of the course. Those random acts of kindness is what makes Boston Marathon Spectators the best in the world. I hope I have the opportunity to be a be part of that amazing cheer squad next year. Nothing is more exciting than running into someone from your hometown. I saw another Charlottesville runner early on in the race and we both agreed it was a day to give up on a time goal. With less than a mile to go, a very speedy Linda Scandore, passed us and said hi on her way to a 10th place Age Group finish and another BQ, surpassing her goal time. WOW! 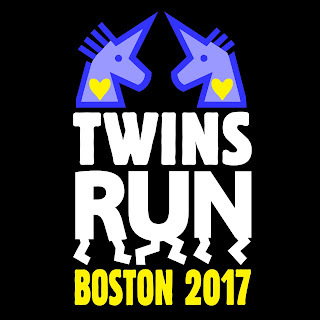 Many thanks to our family, friends, runners and others who donated to Malinda's Dana-Farber Marathon Challenge fundraising page. It's not too late to help Malinda reach fundraising goal by Wednesday, May 17. If you can donate $5 by May 17, we'll match your gift to double the impact of your generosity. No donation is too small and 100% of every $1 supports cancer research.